Sands Resorts Cotai Strip Macao is committed to environmental responsibility by promoting sustainable development, reducing the impact of our operations on the natural environment, and enhancing the resort experience of our guests as well as the quality of life in the communities where we operate. We developed the Sands ECO360° strategy as a roadmap for continuous improvement of our environmental stewardship. 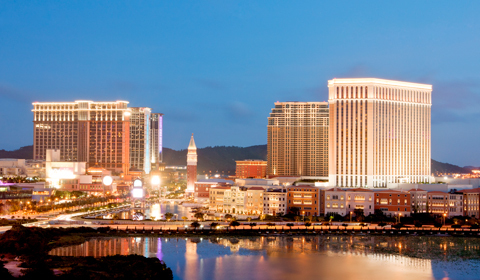 High-performance facilities: The Venetian Macao has earned the Macao Green Hotel Gold Award by the Environmental Protection Bureau of Macao. At our high-performance building, we focus on energy conservation, water conservation, and using products and materials with minimum indoor polluting contaminants. Standard sustainable practices: Standard sustainable practices, which are implemented seamlessly into our operations, include resource conservation, air quality pollution prevention, recycling, and sustainable purchasing procedures. These practices add value to your sustainable event without any additional work or cost required from you. Green Meeting Options: We have a menu of optional services to make your event even greener. The Green Meeting Concierge will customise our offering to meet your sustainability goals. After the event, we will provide a Sands ECO360° Event Impact Statement; this comprehensive report covers energy and water consumption, recycling rate, carbon emissions and highlights of sustainable initiatives - all in one place. Acting according to ethical principles as well as applicable laws, rules and standards. Where laws don’t exist, we aim for industry best practices. Promoting equal opportunities, and actively engaging in an open dialogue with our stakeholders to consider and integrate their input. Providing access to relevant information concerning our business practices. Thoroughly understanding and managing the impacts of our business on the environment and society. Measuring, reviewing and reporting our progress with an objective to continually innovate and enhance the way we conduct business. We offer rewarding career opportunities with exceptional benefits. We are dedicated to recruiting, employing, training, and developing individuals of all ages, cultural and racial backgrounds, and religious beliefs. We are dedicated to the preservation of the environment and conservation of natural resources through our Sands ECO360˚ Sustainability program. We are committed to strengthening the communities in which we live, by purchasing from local suppliers, and minority and women-owned businesses. We support endeavors that assist youth, promote health and expand educational opportunities through philanthropic and volunteering efforts. This policy is supported by our management team who has the responsibility to ensure its implementation throughout all departments, business operations and services, and our supply chain.